Heavy as a kid, teenager, and adult. By 2016 I had grown well past 320 pounds. For the first time in my life, I recently had someone tell me “it must be nice having genetics on your side”. Your simple program and design for living has changed my life. I have achieved this progress with only ONE weekly gym session since January this year. It simply doesn’t feel like dieting — following Tim’s guidelines, I am now eating approx. 30% less calories than I used to before starting the program. I have been frankly blown away by the effectiveness of Tim’s approach and couldn’t be more grateful for it. It’s being able to keep up with riders decades younger than me and hit the backcountry with some of the biggest names in extreme sports. I regularly weigh the same as my wedding day. The way bigger gains have been keeping up with my kids, healing old aches and pains, and fitting into clothes that I have not been able to in many years. No hype or BS, just straightforward methods that work. I couldn’t recommend Superfitdads enough. If you’re on the fence about this, what’s holding you back? Afraid you’ll fail? You’ll fail for sure if you do nothing. 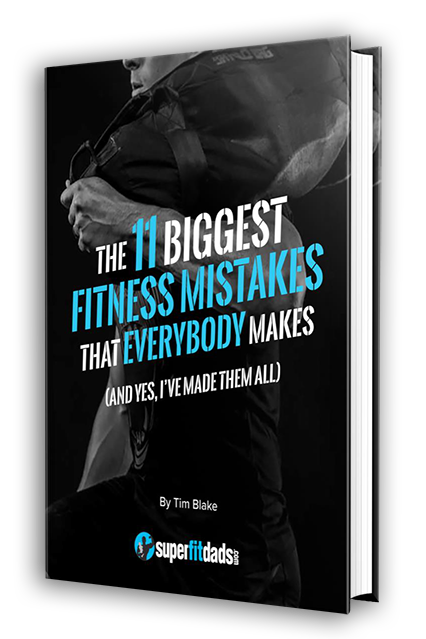 If you want a complex exercise program that will leave you sore and starving, move on. But if you want a practical fitness program that fits into real life and gets sustainable results, this is for you. OK, I’ll admit it – I was skeptical. My life is incredibly busy, I don’t want to give up foods I enjoy or spend hours in the gym. With this program, I don’t have to.